"Crawl crawl crawl little spiders, Crawl crawl crawl little spiders, Crawl crawl crawl little spiders, Halloween is here!".. that song is stuck in my head from volunteering at the preschool haha.. The kids love it and sing it all day long. Candy corn nails.. I think it's great for people that love bold and bright colors. This NOTD I will be showing you if a light or dark base make a difference as well as a How To and some other nail art I added to the Candy Corns. Read on for all the good stuff! For this how to.. I will be showing you how it looks on top of a dark base, a white base and your natural nail. I was suppose to crop out the pinky and show my index finger (which was bare) but I messed up.. Sorry! You just want to grab a make up sponge/wedge. I got a bag at the dollar store =).. The edge of the sponge will begin with the color that will be at the bud of your nail. For the candycorn nails you will want to follow the colors of the candy corn (yellow, orange, white). Just simply brush on the the polish onto the sponge in one stroke. 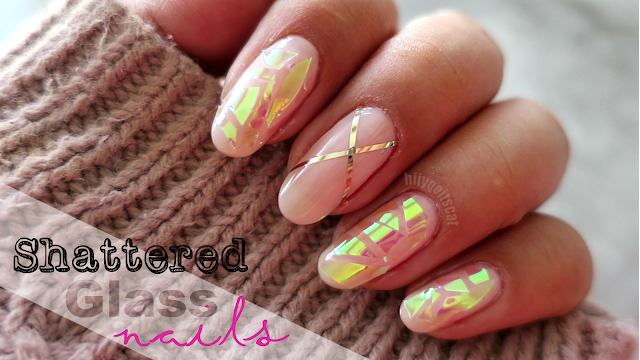 Do this process for each individual nails. Next you want to line it up with your nail and just sponge it on.. For a nice blend or gradient slightly sponge back and forth. At first it will look like the 4th picture.. dont worry though.. a topcoat will smooth it out. You can also do the sponge technique with poka dots.. like the look I did below. It's simple and easier for those without a steady hand. All you do is just dot on the polish from the brush directly to the sponge and dab it on your finger and press the sponge onto your finger. You can do a single color or multiple ones and different sizes. The index finger is my favorite.. I love the little web and spider. The middle finger was suppose to resemble an eye.. but I don't think I achieved it haha. The wedding finger was just shaping it to make the candycorn look more realistic and the pinky was suppose to be a ghost (fail) haha! Don't forget I still have my BagBlaze GIVEAWAY up-- Only 4 more days left!